The interesting named ski resort of Superbagneres is just about visible from Bagneres du Luchon 1170 metres below, with a grey hotel just peeking out above the trees at the top of the long ski lift out of town. In fact, it really doesn’t seem that high when you look up. This is a climb I remember hearing the name of when I used to be interested in the Tour de France during the Armstrong era, so I was quite keen to have a go, even though I couldn’t work out exactly where the road went. The densely tree-lined slope surrounding the ski lift didn’t seem to reveal any of the usual tell-tale signs of switchbacks. The stats for the climb were a little more challenging than the Port de Bales which we’d done the previous day. 18.5 km at an average gradient of 6.3%, rising from 630 metres to 1780 metres. Ok, we thought, harder but really not that difficult compared to some of the biggies that we’d done in the Alps last summer. We should be fine. The road headed out of town to the east of the ski-lift, circling around the back of the hill which explains why there is no sign of a road from Bagneres. What we found as we climbed was that, unlike the Port de Bales which was intermittently steep and gentle, the road mostly maintained a challenging gradient all the way up. Not too steep, except on a few short sections where it kicked a bit, but just hard enough that there were no ‘easy’ bits to recover on. It was very beautiful though. 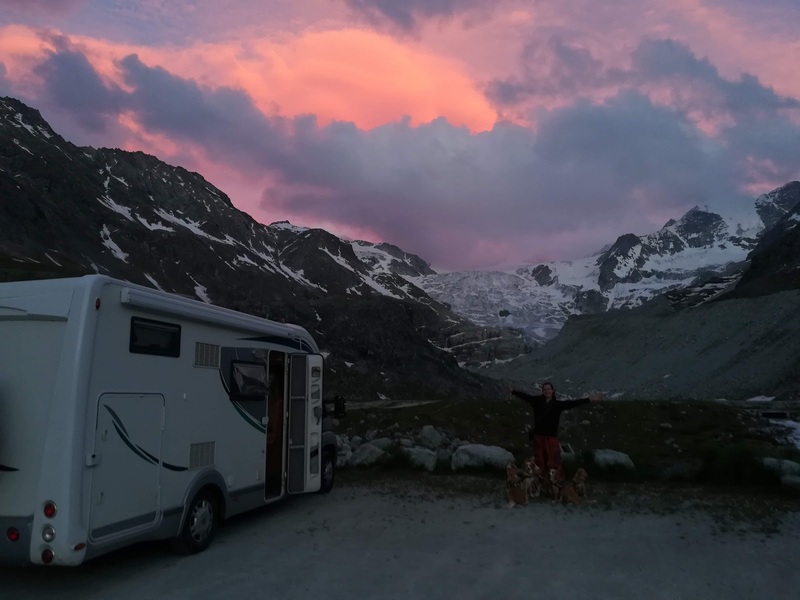 e initial route is tree-lined, but then turns up the Vallee du Lys and the view begins to open out to reveal a stunning wall of rock and summits at the head of the valley. At about 10km gone the road then turns and begins to weave it’s way up the opposite flank of the valley and so providing a brilliant vantage point to appreciate the panorama. 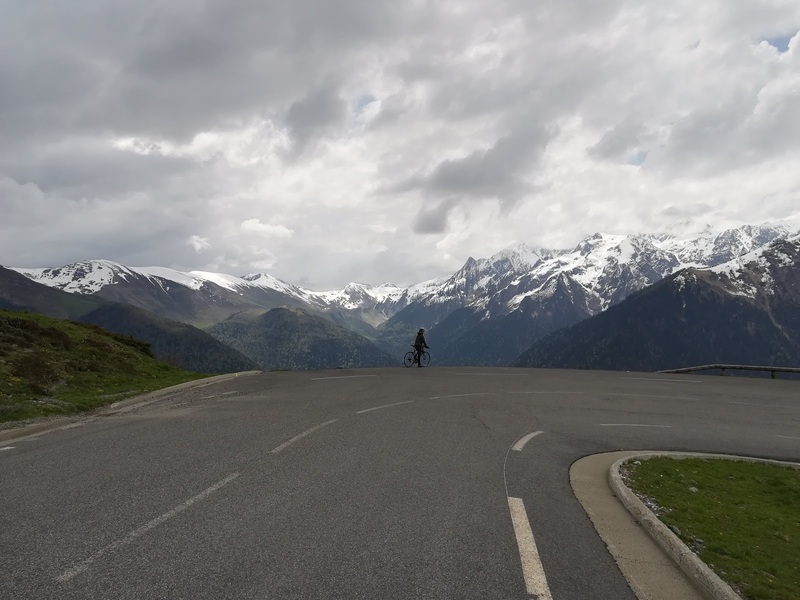 By the time you reach the higher parts of the climb, with just a few kilometres to go, the trees have all but disappeared leaving a fantastic balcony like road to cycle along. Personally I struggled a bit over the last few kilometres. A false summit a few kilometres from the top threw my motivation a little, as I crested the rise to see the grey hotel still some way off, but that was probably weather related. It was getting quite cold by now. Thankfully I’d thought to pack our big coats for the descent. Still, this was definitely a great climb, very visually impressive, and much harder than the statistics imply. A few pictures from the climb.